I love sweet potatoes. And bacon. And eggs. Especially when you add all 3 of these ingredients together in a cast iron skillet. 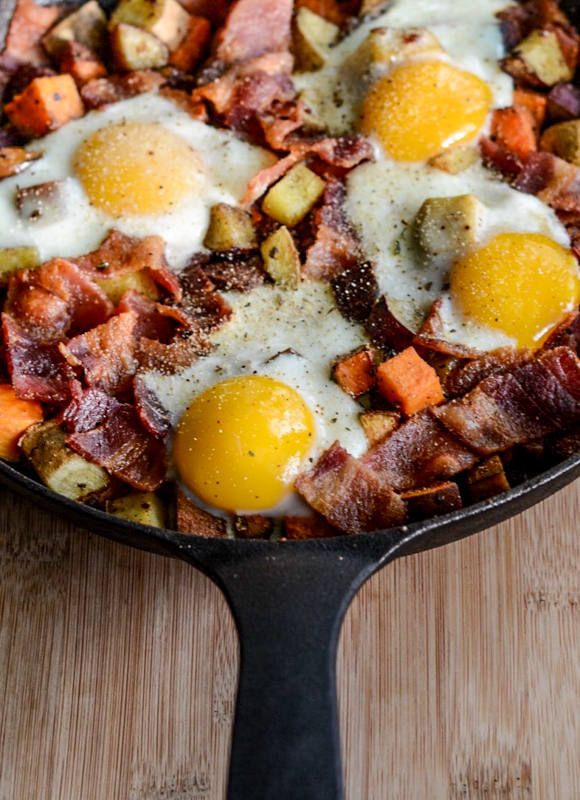 The sweetness of the sweet potatoes with the saltiness of the bacon, and that gooey yolk that acts like a sauce. Here’s an easy recipe that incorporates all 3 ingredients together along with some smoky chipotle seasoning. 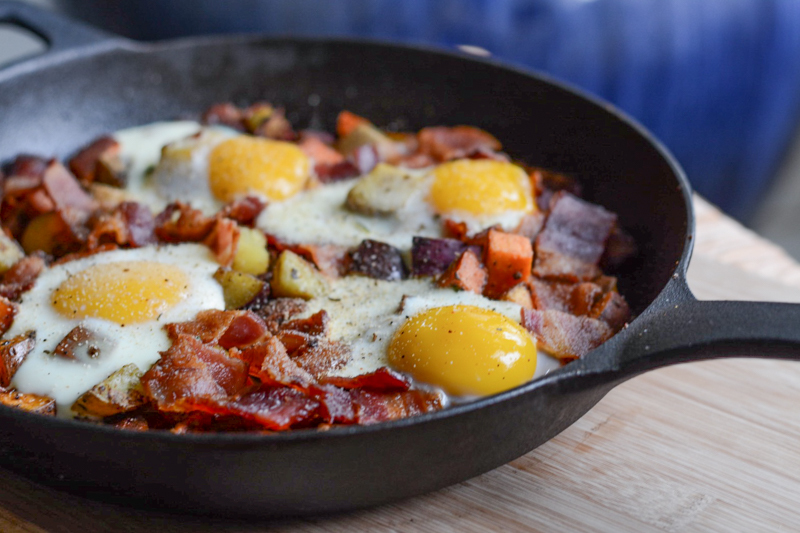 Enjoy this for breakfast, or really any meal of the day! I use FlavorGod Chipotle seasoning, however you may use a combination of sea salt, cracked pepper, chipotle powder and cumin to achieve a nice smoky flavor with a little bit of heat. In addition to using FlavorGod in all my dishes, I also love using OMGhee brand ghee, however you may choose to use regular butter instead. Ghee is made from butter that has been heated and the milk solids and water removed. I have switched to using butter made from grass-fed/pasture raised cows, such as Kerrygold, due to the health benefits versus grain fed cows. Place bacon on baking sheet and put in oven at 425*F for approx 15-20 min. Set aside in paper towels. Meanwhile, heat a cast iron skillet over med-high with ghee and add diced the potatoes. Season with FlavorGod seasoning. Cook on stove or in oven until egg whites are set. You may put a lid on to help steam. Sprinkle more FlavorGod Chipotle and ENJOY!